Hi, YABC! I’m excited to be here today to reveal my cover. I’m K.C. 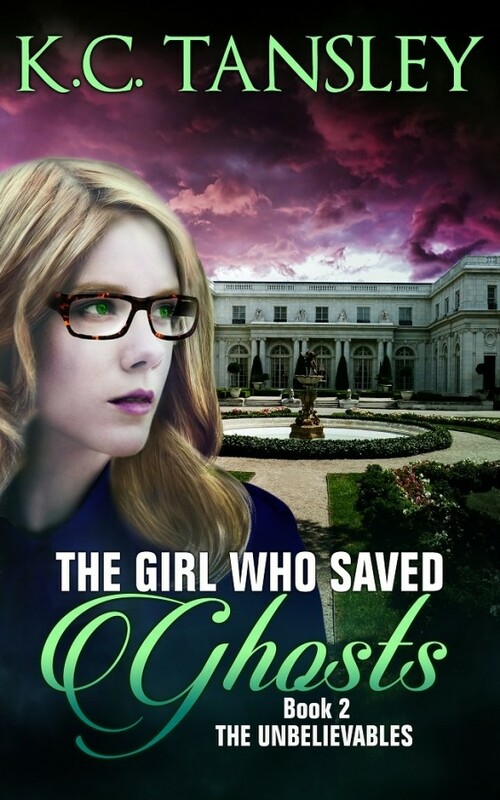 Tansley and I wrote THE GIRL WHO SAVED GHOSTS, the second book in The Unbelievables series. I didn’t think the cover designer could do better than the first book’s cover, but she totally did! I am so beyond grateful to my publisher for putting a girl with glasses who isn’t a size 6 on the cover of my books. When I was younger, I never saw girls that looked like me on the cover of a book and it really bummed me out. (I wore glasses and was a curvy girl in high school. Still am, actually.) Confession time: When I was a little girl my grandmother asked me what I wanted to be when I grew up, and I told her green. So seeing my name in seafoam green, which happens to be my favorite color, is a dream come true for me! K.C Tansley lives with her warrior lapdog, Emerson, and two quirky golden retrievers on a hill somewhere in Connecticut. 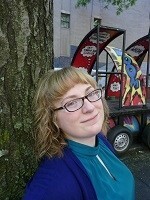 She tends to believe in the unbelievables—spells, ghosts, time travel—and writes about them. Never one to say no to a road trip, she’s climbed the Great Wall twice, hopped on the Sound of Music tour in Salzburg, and danced the night away in the dunes of Cape Hatteras. She loves the ocean and hates the sun, which makes for interesting beach days. The Girl Who Ignored Ghosts is her award-winning and bestselling first novel in The Unbelievables series. Four winners will each receive a paperback advance reader copy with a personalized note, temporary tattoo, and wristband. Thanks so much for hosting my cover reveal and giveaway today! You guys at YABC are amazing! Thanks so much for hosting my cover reveal and giveaway today! :) You guys at YABC are amazing! The cover is gorgeous and the plot is amazing! I want to read this book! Thank you so much, Angela! Best of luck in the giveaway! I love this cover! The first book is still one of my all time favorites! Thanks, Emily! That is so fantastic to hear. Thank you! Personally, I think this one is even better. Good luck in the giveaway! Thanks, Emily! That is so fantastic to hear. Thank you! Personally, I think this one is even better. ;) Good luck in the giveaway! What a cool cover that interested me in digging deeper into this story. I love ghost reads & I have goosebumps just looking at the cover. Wow, thanks, Pam! That's the exact response I was dreaming about to this cover. I love ghosts. Best of luck in the giveaway. Sorry to hear the cover wasn't to your liking. Hope you'll check out the ebook then. Well I absolutely love the cover. It's the castle And I love the synopsis. Well I absolutely love the cover. It's the castle :) And I love the synopsis.